following criticism from PHSOtheFACTS members. But it is not clear from their actions just how they will monitor or challenge the performance of the Health Service Ombudsman on behalf of patients. Representing patients and not organisations should be their core role. The Patients Association has for some years been highly critical of the performance of the Parliamentary and Health Service Ombudsman (PHSO). This has been for good reason: we have received abundant evidence of PHSO letting patients down, and making things worse when they needed it to help them right a wrong. In particular, we issued three reports: ‘The People’s Ombudsman – How It Failed Us’ (November 2014); an immediate follow-up, ‘PHSO – Labyrinth of Bureaucracy’ (March 2015); and a final follow-up report in December 2016. PHSOtheFACTS member Nicholas Wheatley describes some key ways in which the Patients Association could actively monitor the progress at PHSO during their ‘change programme’ and make this information available to patients and complainants. He also points out that retrograde steps taken since the arrival of the new Ombudsman Rob Behrens will impact negatively on transparency and trust. Thank you for your reply to my email and your offer to deal with our requests for help. We simply ask that when people contact the Patients Association to complain about the PHSO, that they are made aware that there is a user group, PHSOtheFACTS, to which they can turn if they so wish. One of the most distressing things about being a victim of mistreatment by the PHSO, as I am only too aware, is the sense of helplessness and isolation at having nowhere to turn to. Knowing that there are others who have been through the same ordeal is a great comfort and empowers one to believe that it is possible to fight back and not simply be a victim of injustice. It would also be helpful if you would publish or record and make available statistics showing the number of complaints you receive about the PHSO on a monthly or quarterly basis, as this would give a good idea of any ongoing improvement in the service provided by the PHSO. It would also be of help to publish details of the issues discussed at the regular bilateral meetings between the Patients Association and the Ombudsman, to give people an idea of how the Patients Association holds the Ombudsman to account. I believe the most recent meeting occurred on 25 June. It is disappointing that the Patients Association is not actively campaigning for further reform of the PHSO. We have no confidence that the current strategy will result in an improved service. It is not the transformational change required to create an Ombudsman service fit for purpose. Of great concern is the fact that the Ombudsman has removed the possibility of external review of complaints. You may be aware that external reviewers were instrumental in overturning incorrect decisions for the cases of Scott Morrish, James Titcombe, Nic Hart, and Maggie and Janet Brookes amongst others. This retrograde step will make it much more difficult for complainants to achieve justice through the PHSO. I’m sure you will also be aware that the Service Charter performance has shown no significant change over the past year while the most important indicators for gathering information and explaining decisions have actually worsened slightly to just 42% and 57% respectively for the first quarter of 2018. At the same time the performance statistics have fallen through the floor with 537 investigations completed in the final quarter of 2017, a drop of nearly 50% from the previous year, and the report withheld for the first quarter of 2018. At some point questions will need to be asked about whether the Ombudsman’s strategy is working or whether the problems at the PHSO require a more rigorous and fundamental approach. You will be aware that from Gosport to Mid-Staffs, via Morecambe Bay, Southern Health, Bristol, and many others, the complaints system failed to pick up on health scandals which cost many lives. There are likely to be other scandals currently occurring and lives being lost. 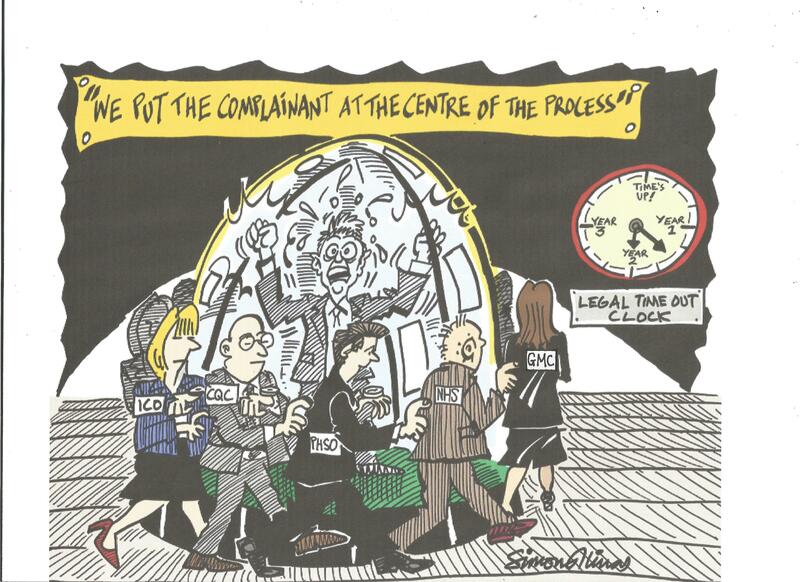 A properly functioning complaints system, with a robust Ombudsman as the most important tier, would likely identify systemic failings at an early stage and prevent them from developing into full blown scandals, saving lives in the process. This is the kind of Ombudsman we would like to see, but without campaigning pressure this will never be realised. We hope you will re-evaluate your position with regards to the PHSO and adopt a more proactive and critical approach to Ombudsman reform. It is clear that the Patients Association is ‘working with the Ombudsman’ through a series of pre-planned meetings. By January 2018 their position had changed and no support was offered. Thank you for contacting The Patients Association. I was sorry to read that your complaint remains with the PHSO and that it has not been resolved, this must be very frustrating for you and your husband. Margaret, we have had a number of personnel changes and structural changes since you first contact the charity. These changes have meant that we have been unable to continue engaging in casework, which includes having the resources to attend meetings to support complainants. Regrettably, until we have adequate resources we would be unable to support you by attending the meeting proposed by the PHSO-please accept our apologies for this. It is encouraging that the PHSO wish to meet to discuss your complaint and I hope that the outcome will be a positive one for you and your husband. If you wish to keep us informed about the progress of your complaint please feel free to do so as we are keen to hear from patients about their experience and whether their complaints are resolved to their satisfaction. Margaret, I wish you the best of luck in your meeting with the PHSO. Please do not hesitate to contact us if we may be of assistance. 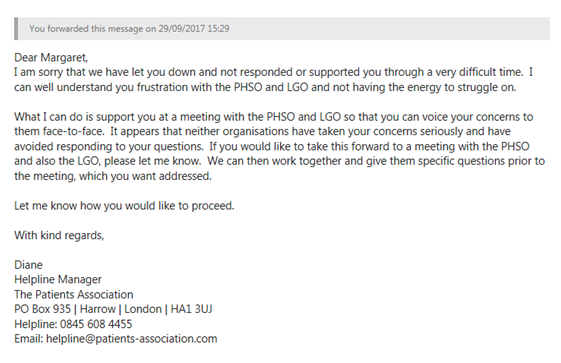 It would appear from this correspondence that the Patients Association only have the resources to monitor the progress at PHSO by listening to the PHSO themselves. This one-sided approach will not reveal evidence of intentional bad service or corruption of purpose when conjecture replaces evidence-based decision making. Members of PHSOtheFACTS are concerned that the Patients Association cannot be relied upon to be the voice of the patient unless they continue to work closely with patients throughout all stages of the process. Previous Previous post: Why are the Patients Association shocked at the Gosport findings? It is not based on science or evidence-merely spin and assurance of the new PHSO. Neither myself nor dozens of others who raised serious systemic issues with PHSO have any evidence at all that the Strategic Review (‘back to basics’) will address the major failings identified – in fact there is massive evidence to the contrary! Interesting use of the word malice by the PA in relation to their comments regarding the PHSO. It remains unclear how the PHSO are implementing the promised changes. Despite the promises for some time now for reform now running with their new Ombudsman, personally I have received one acknowledgement but nothing resolved, and reminders ignored following thier promise to deal fairly with my case, currently so obviously a subject of corruption – not malice – as they deliberetely and blatently fictionlised matters and withheld facts for their ‘report’ ensuring those who caused me to complain are exonerated enabling them to carry on regardless. Defend and deny or ignore continues in line with the PHSO remit as ever (whilst they work out changes?) with the support of the PA for reasons best known to themselves. Sadly the “Patients Association” is a charity, and as such is limited by not only cash flow but also probably a high turn over of voluntary staff. There is no doubt that for simple day to day issues and problems the P.A can point patients with problems in the right direction to address minor problems. However whilst the PA can issue reports comments and complaints about the PHSO ( which is a law unto itself) They have no teeth to do anything about the persistent evasion of accountability not only by NHS Trusts but also the PHSO and politicians who do noting for their electorate when they have a problem with the PHSO or PACAC. In the public consultation part it is proposed to make medical negligence a criminal offence of either manslaughter or murder. It was also pointed out that coroners inquest very rarely took evidence from the family of the deceased. It is in my view encouraging that the GMC should take it upon itself to raise such radical issues, when it seems ot me that too many NHS Trusts and the PHSO spend a great deal of time and effort covering up “errors and omissions” which are unforgiveable. Personal experience has not been that the PA supports patients or makes a difference. They don’t reply to emails, despite serious provable failings in both NHS and PHSO, therefore how can they call themselves a patients association. I don’t also know how they can proclaim they do not believe there is corruption by PHSO when so many complainants can prove there is. For starters, it’s corrupt to be biased towards the body, because they claim loudly and repeatedly how independent they are and yet demonstrate otherwise. Failing to request evidence from bodies regarding specific complaints details, accepting cherry-picked information supplied by bodies and arbitrarily deciding absolute evidence doesn’t mean what it clearly does mean, is nothing other than corruption. PA mistakes corruption and malice. Malice is personal and often directed by one person towards another. PHSO doesn’t make it personal, corruption is inherent in the way they practice, for whatever reason. When PHSO write to an authorty and say, you don’t think it was poor hospital discharge and we will agree with, but if you apologise for that,we won’t look at the other 5 complaints, isn’t that collusion? Or cruption? I had the same crockadile tears from PA but that was all, no help, just a request for a donation. All fur coat and no trousers! Never mind, earns someone a living, and others expenses. We have so many ‘regulations’ that NHS ‘must comply with’. Yet where is the monitoring? Gosport identifies there is at best patchy weak monitoring. Where does PA note the absence of monitoring? or CQC require evidence of it actually existing? Mid Staffs, Shipman, Morecambe Bay tragedies would all have been exposed earlier and lives saved if NHS had effective management. Effective management requires monitoring of service delivery and cost. In my 11 years contact with PHSO, PA and NHS I have yet to see the evidence of effective management/monitoring. PHSO regularly identifies ‘maladministration’ which can be defined as ineffective management. PHSO implies it is minor administrative issues yet even these should be under scrutiny by managers within the NHS. They are obligated to demonstrate Value for Money for our public funding so where is it being demonstrated and why do National Audit Office audits ignore it? I just want to know are ALL pateints included in the Patients Association and I would like to know who funds the PA? I have seen a Subject Access Request. It shows that when the complainant just mentioned approaching the PA, whilst the investigation was on-going, the PHSO risk rating rose. If the PA withdraws support for PHSO complainants, who will pay any scrutiny, who will check for bias, who will speak up for the complainant when the crucial evidence is overlooked again and again? Now there is to be no external review of PHSO decisions, the Watchdog is unaccountable. David, I was informed by PHSO that if I contacted any third party whilst they were investigating my complaint they would cease investigation. I was also informed by them that if I started legal proceedings against the NHS trust or Surrey Adult social services they would also cease investigation. My hands were tied by that condition for over two years . They then advised there was maladministration and closed the case. The Patients Association is a charity which has no particular legal status other than as a source of advice and support for patients. PA claim their remit is “When patients, service users and their families need help, we ensure they get it by providing advice, support and guidance.” and “Today we remain the only national campaigning charity covering all of health and social care that also works directly with patients.” (https://www.patients-association.org.uk/the-difference-we-make). Well, if you don’t reply to emails, even when your system has allocated a helpline case number, then you aren’t offering anything at all. Where is the support they offer? Signposting is not all that seeing as most people have access to Google to find out for themselves what their rights are and which avenues to pursue. 6 out of 10 are current/ex NHS or have done connected projects (£s), another two public sector (one of whom is an NHS regulator), only two out of the ten appear to be genuine lay persons. So that leaves you to wonder exactly where some of the funding originates and whether there is a conflict of interests or an incentive to go easy on the PHSO. Spill your guts out to them about how you have been seriously abused by the NHS . They promise you the earth and do absolutely nothing. What a waste of space! Interesting comment Ron. I have just been to my local C.A.B. where I was asked for lots of personal details before they would talk to me. When I explained the problem they said they could not help. Another organization full of promise and no substance.